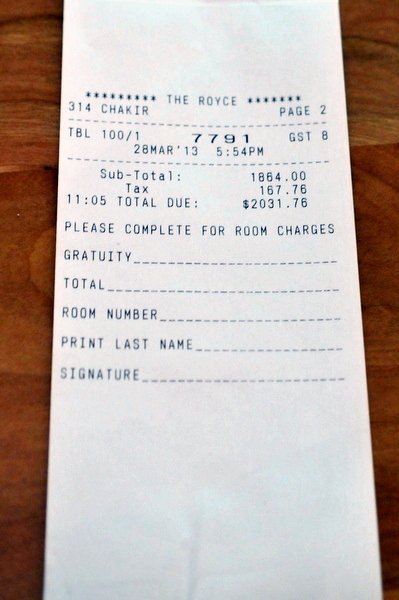 The Langham and the Ritz-Carlton before it, have always taken a more serious approach to hotel dining. In fact the Langham has been home to some of LA's most progressive cooking first with the Dining Room under Michael Voltaggio and more recently The Royce under Chef David Feau. Unfortunately Feau's contemporary French cuisine never really caught on with the local crowd or hotel guests. Despite serving superb food the restaurant always seemed mostly empty so it was no surprise when the hotel management decided to take a restaurant in a new direction at the beginning of the year. While I was sad to see Feau leave The Royce, I was hoping the new Wood-Fired Steakhouse would be just the thing to replace the declining CUT as LA's top steakhouse. To the hotel's credit, they hired the perfect man for the job in Chef Anthony Zappola. The long time Craft alum had been part of Colicchio's company for the past 8 years, most recently as the chef de cuisine at the LA outpost. 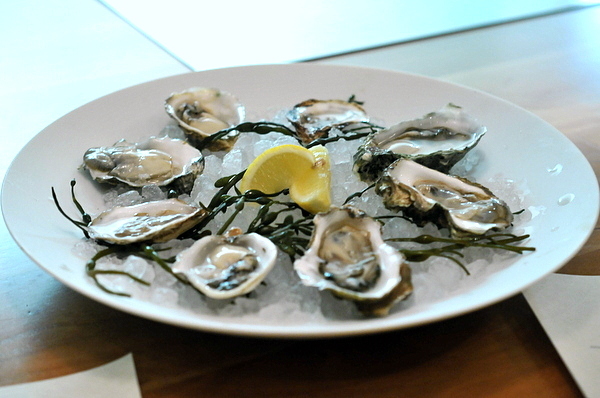 We started the meal off with a trio of oysters a raw Kusshi, grilled Crystal Bay, and a Gratin Misty Bay. The grilled preparation with its subtly smoky perfume would have been the star but for bits of grit and shell that accompanied it. 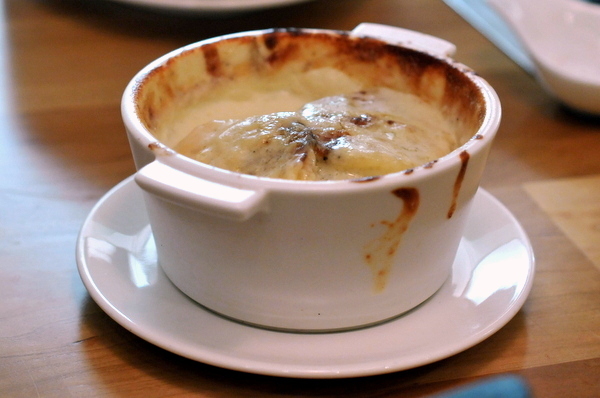 The Kusshi was a touch saltier than normal but still quite tasty while the oyster gratin had a rich buttery flavor with a twinge of salty verve. 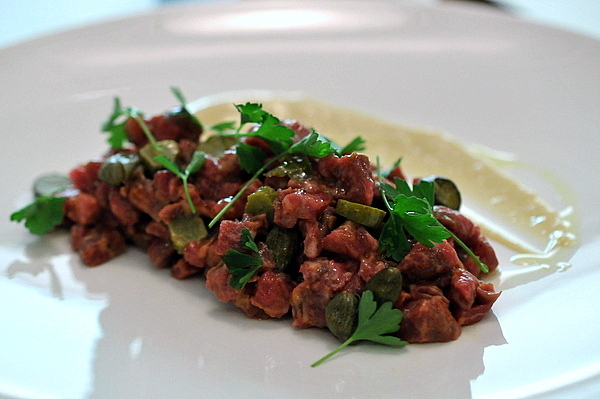 No steak restaurant would be complete without a tartare on the menu. 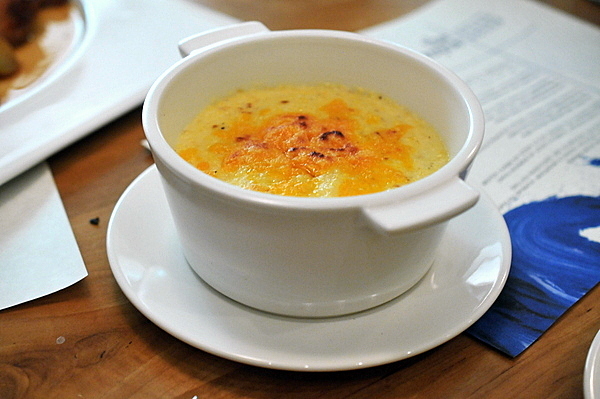 This one blends large chunks of toothsome steak with thick pieces of cornichon. I thought the Tabasco vinaigrette would be overly harsh but the sauce was a satisfying blend of vinegar and spice. 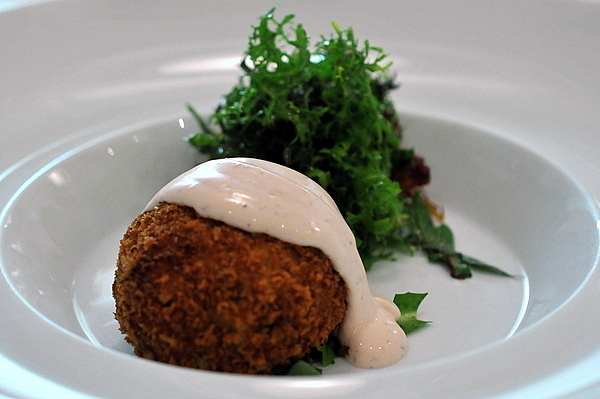 This was a solid crab cake built around a core of sweet meat but the surrounding batter was a bit distracting. The sumac and lemon yogurt provide a prominent acidity that helps balance the weight of the cake. I ordered this dish hoping to compare it to CUT's preparation but the two couldn't be more different. CUT's version is very Asian influenced where this preparation is more akin to a beef prosciutto. 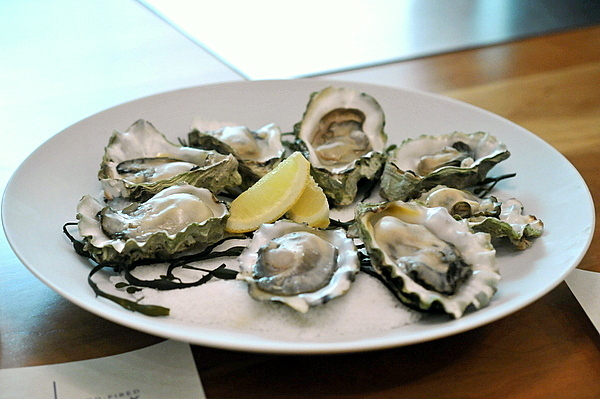 The meat is salted and dried giving it a smooth even texture and a rich umami-salinity from the salt cure. 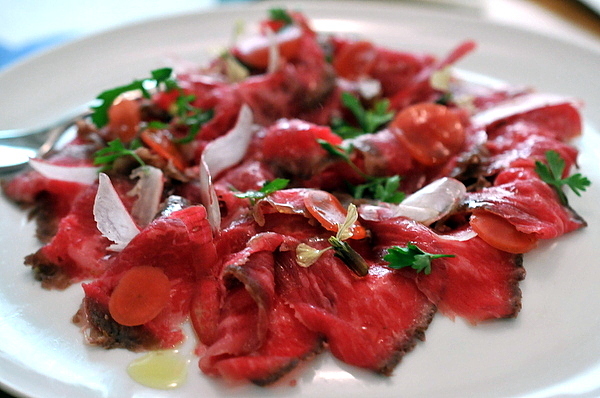 The radishes provide a sharply contrasting bitterness that tempers the richness of the beef. 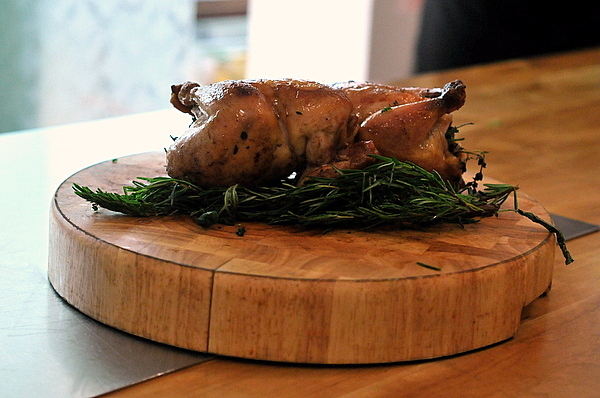 The chickens came presented on a cutting board dressed with rosemary and thyme. 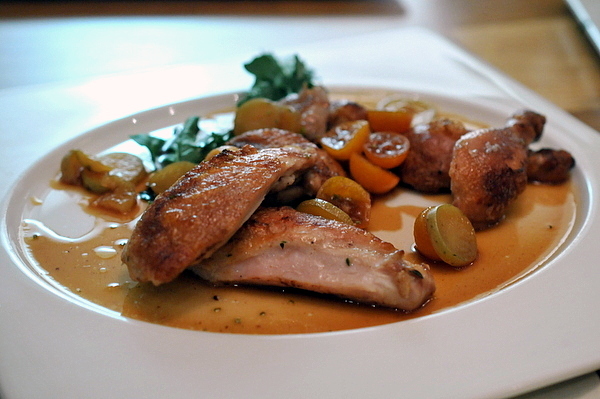 The bird itself is immensely flavorful with a taut dense slickness reminiscent of a game bird. I have to admit I would be tempted to order this again. 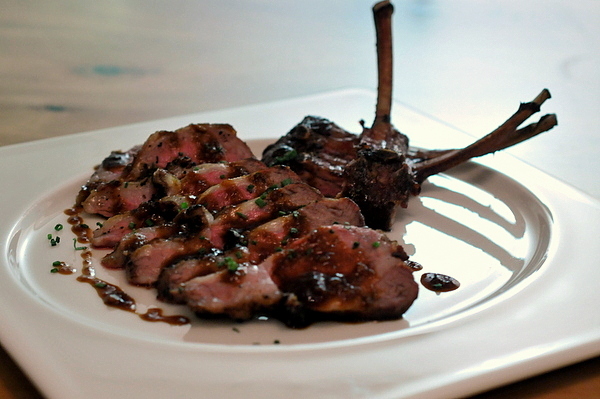 It has been awhile since I've seen such gamy lamb, but aside from that this was a well prepared rack. The meat is tender and nicely complimented by the curried kick of the vadouvan jus. Sadly the best part of this dish was the vegetables, thanks to the char imparted by the wood-fired grill. 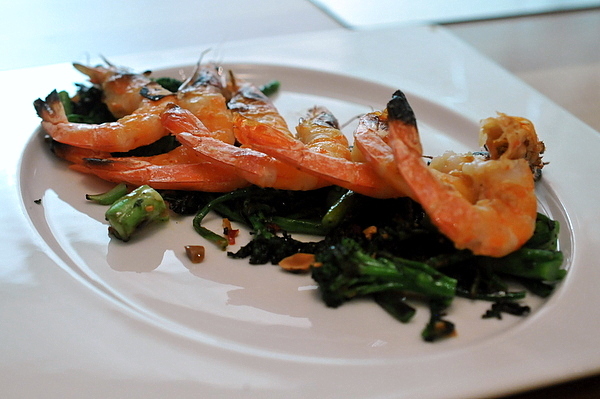 The prawns themselves were a touch limp for my liking though they did have a good bit of salinity to them. Along with our non-steak entrees came three sides. 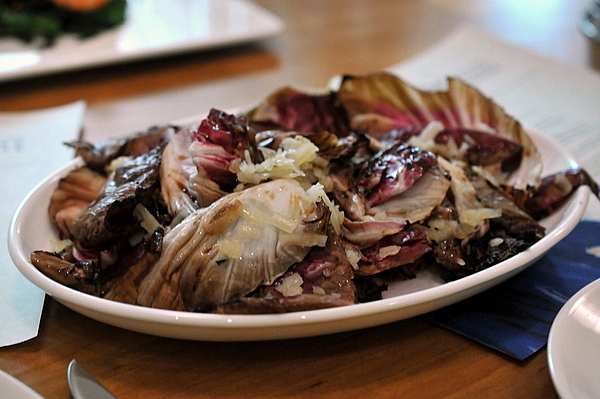 The radicchio was as bold and bitter as you please with a pleasing crunch to boot. I was excited to pair the polenta with the prawns, a sort of impromptu shrimp and grits, but the flavor was disconcertingly sweet thanks to a heavy dose of vanilla. The Mimolette was evident in a stringy sensation on the grits but the flavor was surprisingly absent. Red Peas are a Jamacan name for kidney beans. 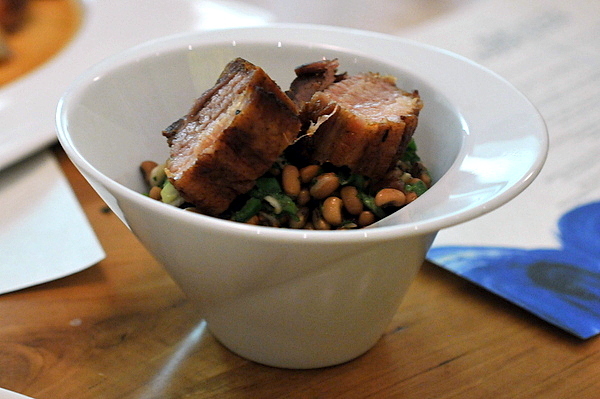 The dense starchy legumes were seasoned with a mix reminiscent of salsa giving them a lively zest. I didn't get to try the bacon but with the abundance of fresh flavor I didn't miss it either. 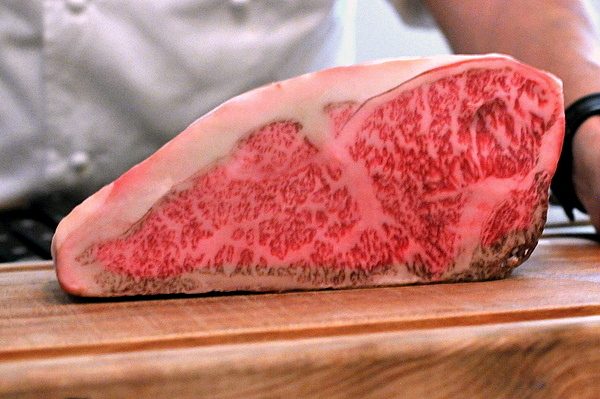 Moving onto the steaks we started with the big guns, a Kobe-style beef from Gunma prefecture. 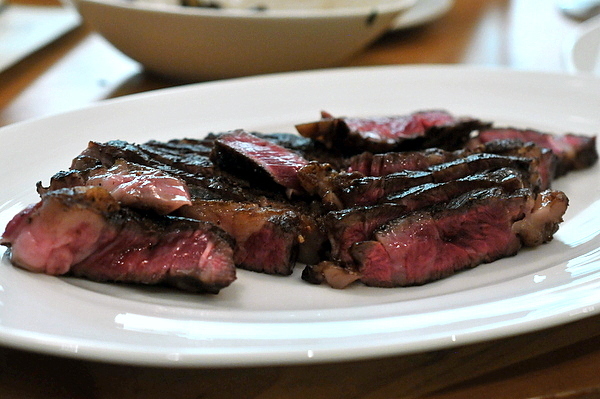 The steak was a beautifully marbled A5 New York cut oozing with rendered fat and a heady buttery richness. You can believe that we ate every last piece of this wonderful cut even the gristle and silver skin. 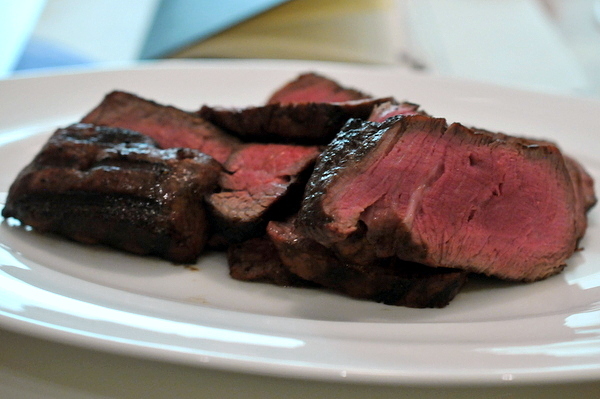 The filet was the weakest cut of the night, the beef was certainty tender but lacked sufficient flavor for my tastes. The New York strip was much better, served on the rare side, the meat had a pleasing slickness and more apparent beefiness than the filet. 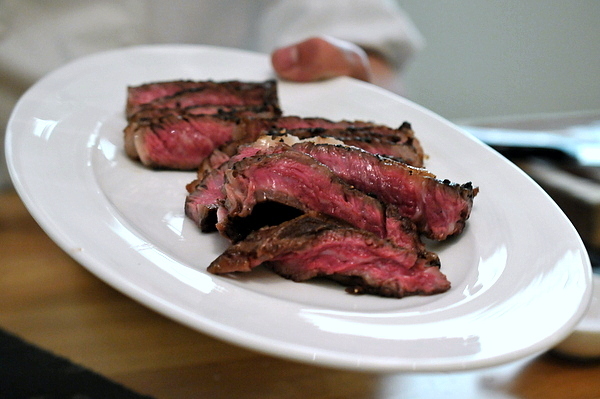 Though still wet aged, the Brandt beef was far more impressive than the Moyer Farm cuts. 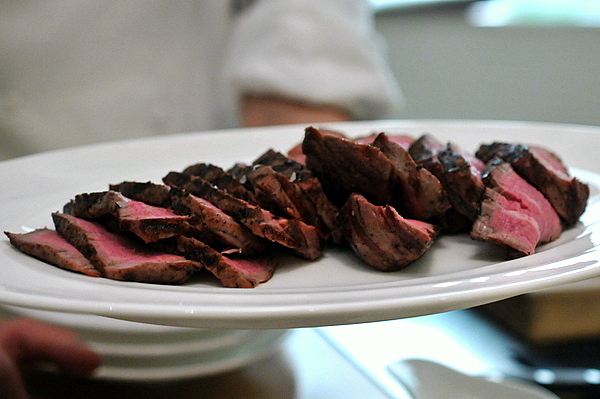 The meat is organic and has a lean steely character along with a smoky char from the grill. Again the filet was a bit mild but the rib eye had plenty of fatty goodness to go along with the simple seasoning of salt and pepper. 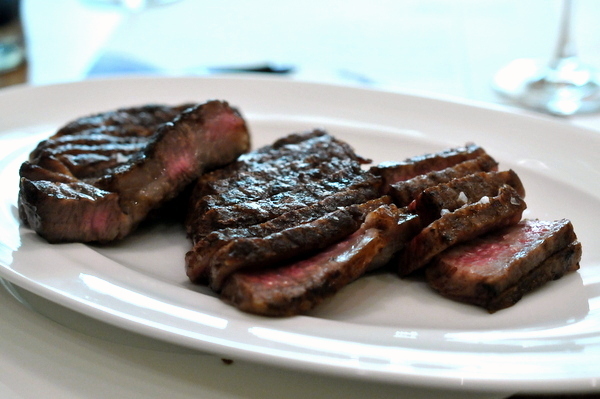 The Australian Wagyu blends traits from both the classic American beef and the luxurious Japanese steak. 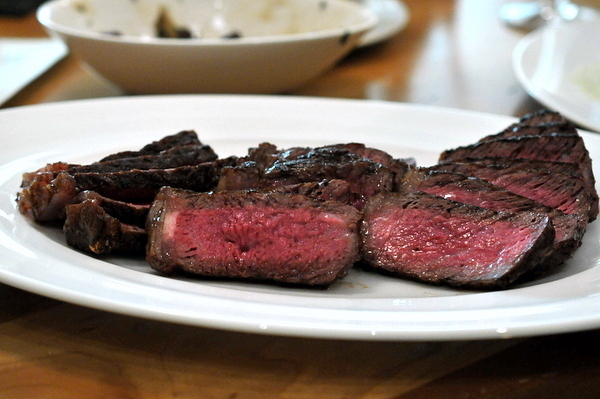 The meat has a slightly softer texture thanks to the added marbling but doesn't feel like eating pure fat. 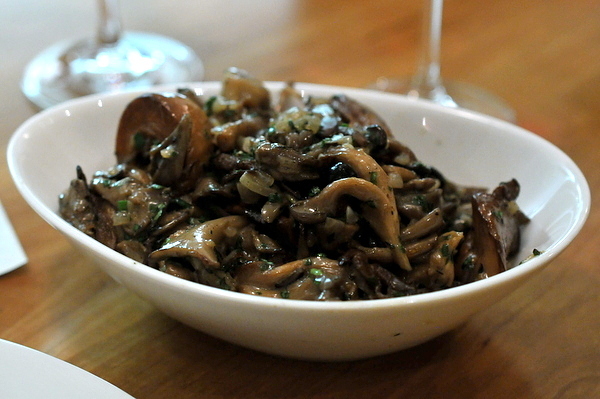 Earthy and smothered with a creamy buttery glaze, these were quintessential steakhouse mushrooms. 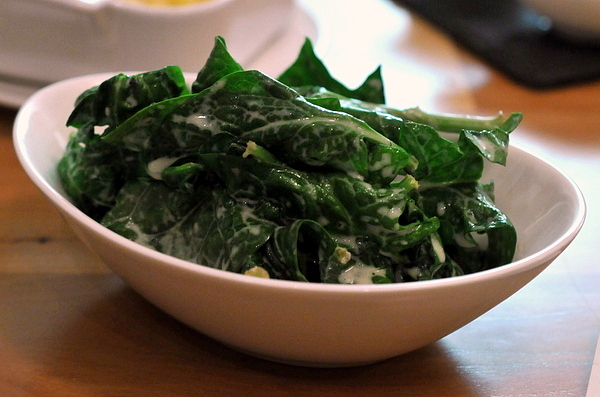 The spinach was one of the best night's sides. 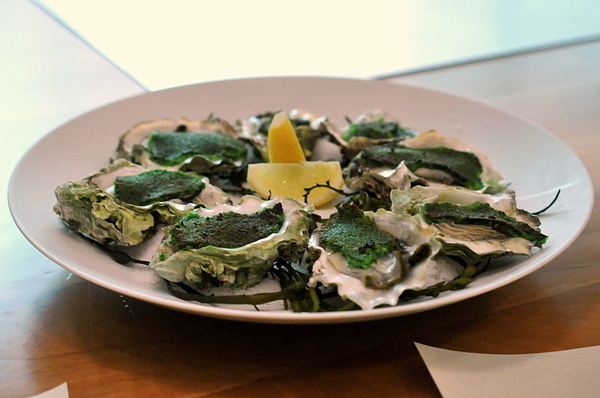 The crisp leafy greens are coated with a luxurious truffle laden dressing that the entire table enjoyed. No steak dinner would be complete without some kind of potato dish and while I'm normally a sucker for gratin a bit bland and too runny. 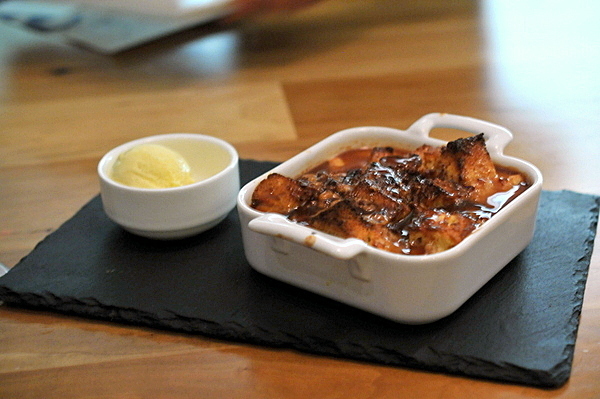 Desserts got off to a strong start with the maple syrup giving the brioche a French Toast like flavor. The idea of mushroom ice cream was intriguing but the flavor was more like a conventional vanilla than I was lead to expect. 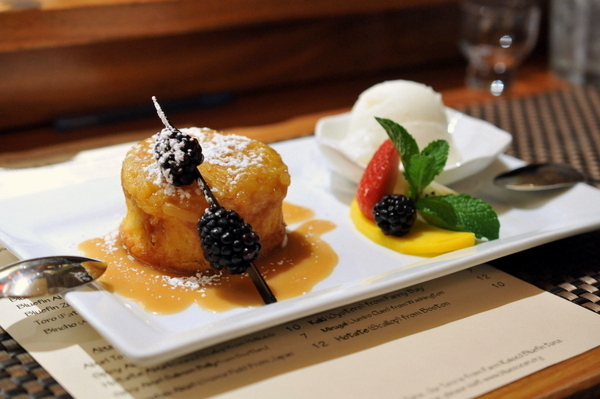 The second dessert was a baba al rhum and while I normally abhor rum cake, the spice of the ginger and caramel sauce help balance the booziness of the rum. The most restrained of the dessert, the Dutch baby is akin to a pancake fitting given the dessert is sometimes called a German pancake. 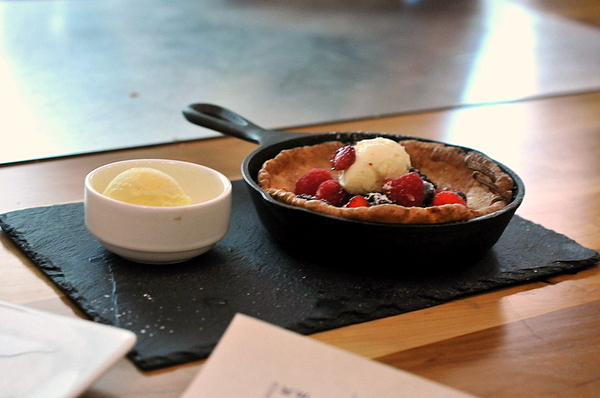 The lightly sweet popover serves as the perfect wrapper for the vanilla and fresh berries. 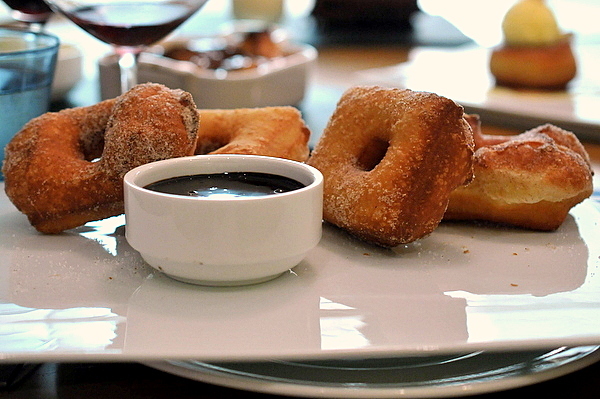 I'm typically a sucker for freshly fried doughnuts but these were a bit disappointing. Not that they were bad by any means but the texture was a touch too dense and doughy for my tastes. 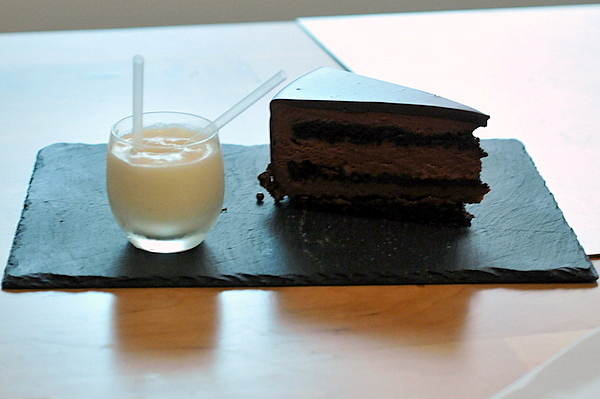 Utterly rich and sinfully decadent, this was pretty much everything one would expect from a chocolate cake. The elevated steakhouse fare at the re-imagined Royce clearly has been designed with the an eye towards pleasing the local market. Any good steakhouse lives or dies by the quality of its beef and while The Royce's steaks are certainly enjoyable I would have liked to see more dry-aged selections. 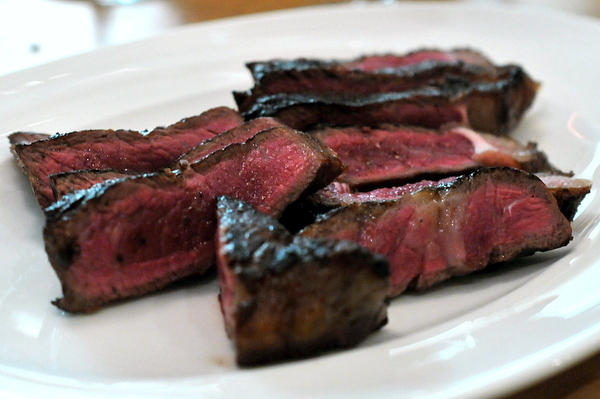 Zappola explained that dry-aged beef isn't as popular with diners hence the restaurant's decision to focus heavily on wet-aged cuts. With the transition from Feau to Zappola, The Royce has traded sophistication for accessibility but as this meal has proven that isn't necessarily a bad thing. 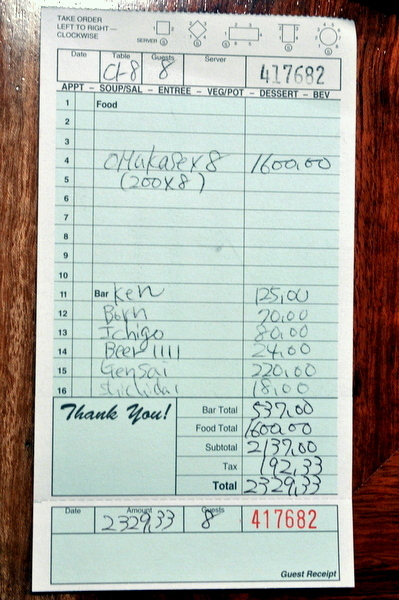 I visited the restaurant during my pre-blogging days back in 2007 and was quite satisfied with my experience. Finding myself in Denver for business I thought it was time to revisit Sushi Den to see if it remained Denver's best for sushi or if competitors like Sushi Sasa had finally caught up. One of my coworkers decided to join me and despite being a Monday night we had to wait over 20 minutes for two spots at the bar to open up. As soon as we sat down, our itamae presented us each with a serving of pickled cucumbers and though I enjoyed the acidic bite the marinade was a touch salty. 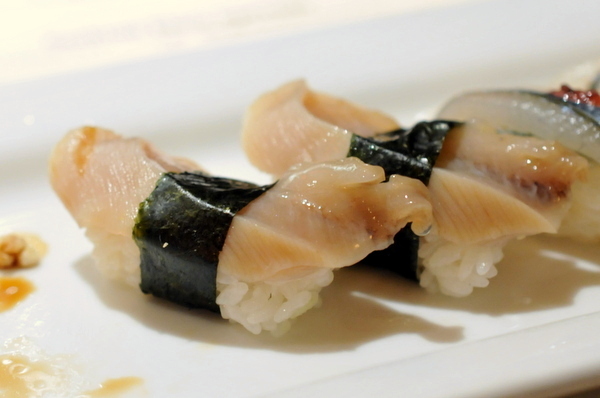 I've only had raw albacore on a handful of occasions and the fish is always exceedingly tender to the point of having an almost watery consistency. 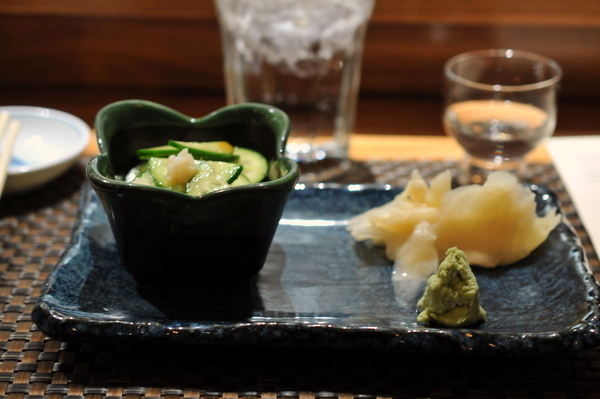 Fortunately the fresh wasabi provided more than ample distraction from the bland texture of the fish. Nanbanzuke or "Southern Barbarian Pickle" is a culinary technique where fish is first fried then marinated in vinegar. The fish felt a bit stringy but the flavor was quite nice with the marinade's citrus levity countering the fish's inherent oiliness. 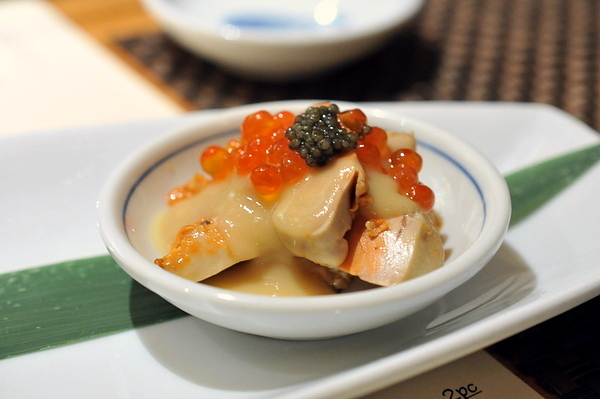 The duet of ankomo consisted the classic steamed preparation with scallions, momiji oroshi, and ponzu as well as a smoked variety with white miso and caviar. The smoked ankimo was the clear winner here with a creamier texture and lovely salty-sweet contrast from the sauce and roe. 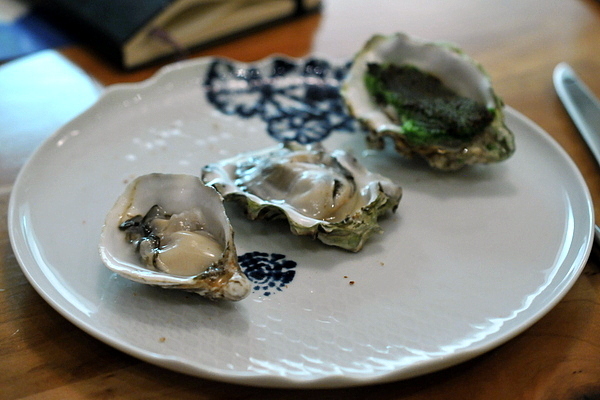 I believe these were Kusshis given their deep cup depth, compressed dense texture, and sweet flavor. 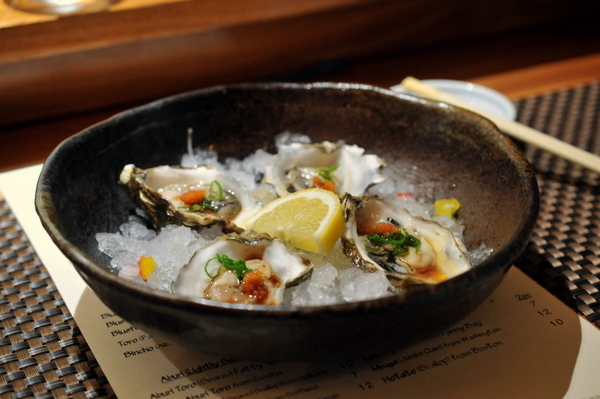 Served in classic Japanese fashion the acidity of the ponzu paradoxically amplifies the bivalve's inherent sweetness. While I'd never order spicy tuna on my own far be it from me to refuse the chef. 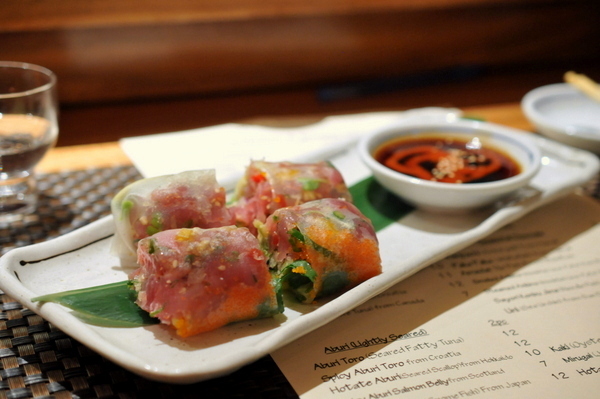 The spicy tuna itself is nothing to write home about but the rest of the dish makes the fish better. Along with crunchy tempura bits the fish is mixed with basil, mint, and cilantro providing a Southeast Asian flourish to the dish while the rice paper adds a slightly gummy toothsomeness in place of the more typical sushi rice. The sushi purist in me feels guilty for liking these but they were just so damn tasty. This is my second time having blue cheese at a sushi restaurant in as many meals and the combination remains just as effective. The small dab of blue along with the handful of caviar pearls provides a cogent combination of pungent sweetness and salinity that seasoned the fish beautifully. 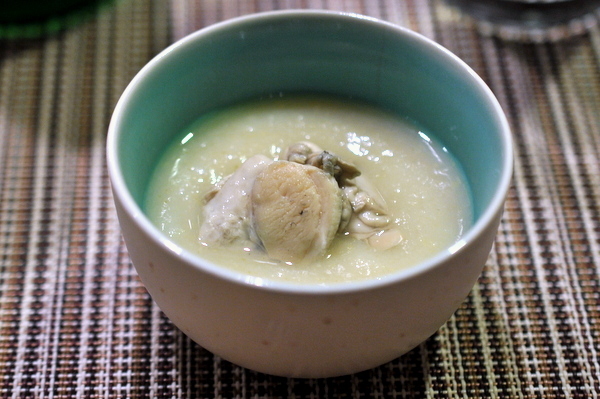 The geoduck was served in rather substantial pieces that highlighted the clam's natural salinity. While I enjoyed the dense muscular texture and salty-sweet flavor my companion found this piece a bit disconcerting. This was the most refined and nuanced piece of the night. The kelp serves to impart a light but deep-seated savor to the inherently mild Sayuri while simultaneously drawing out some of the moisture and giving the fish a firmer texture. 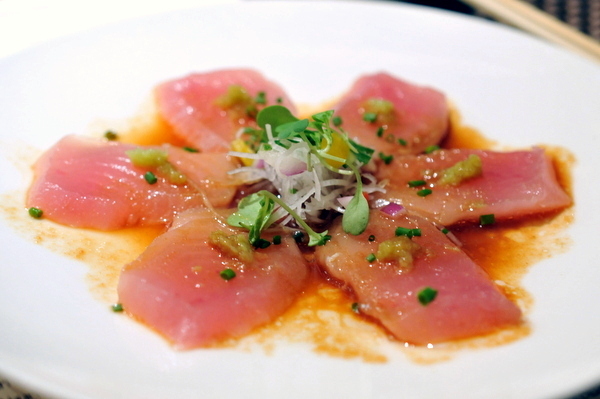 The accompaniment of shiso adds an elegant touch of freshness while the sour plum provides a contrasting electric tang. 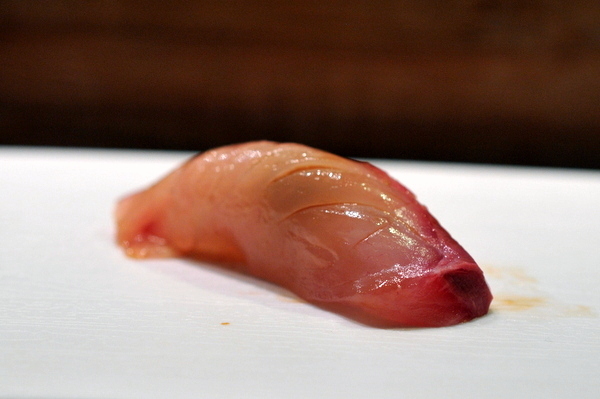 I've only had akamutsu on a two prior occasions and both times the fish's high fat content gave it a uniquely even consistency. The heavy sear imparts a meaty smack to the fish and the rendered exterior takes on a jellied sticky texture almost like congealed fat that I found absolutely delicious. This was a everything one would expect from a scallop, soft and brimming with sweetness. I appreciated the inclusion of some of the "foot" or adductor muscle of the scallop which added a crunchy textural contrast to the otherwise tender meatiness of the scallop. 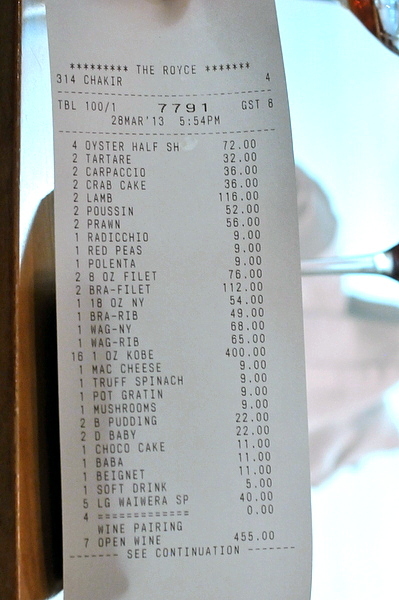 At this point the chef asked if we wanted anything else and I wasn't about to leave without trying some of their toro. I opted for the seared variety and wasn't disappointed. 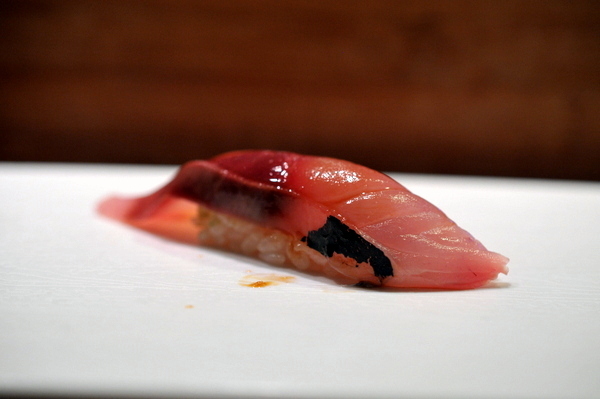 The fish has the abundant oily texture and flavor of good toro augmented by a hint of warmth and lively smoky savor. 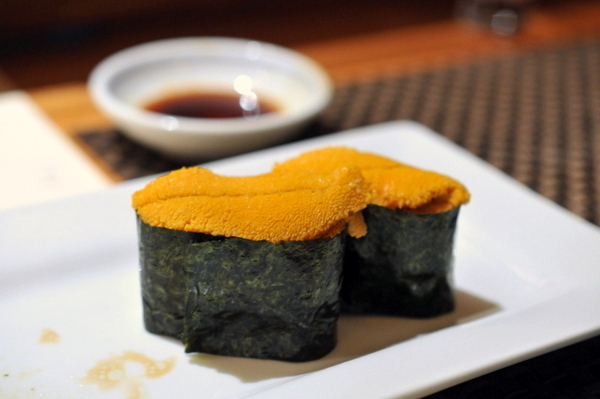 My companion who is something of a sushi novice was a good sport about the meal, trying everything without hesitation so I decided to test him with some uni. 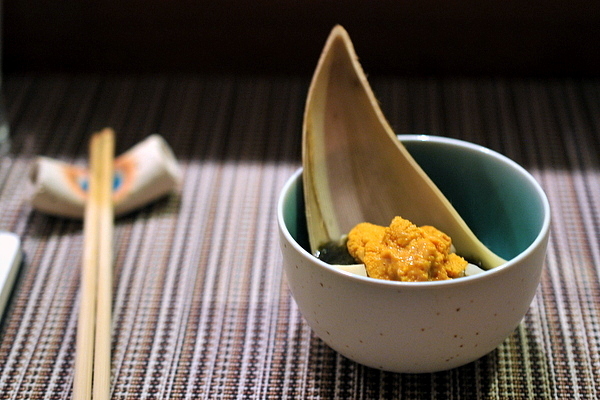 Our itamae assured me the uni was excellent and he wasn't kidding, the beautiful yellow-orange color, a perfectly creamy consistency and a soaring sweet flavor all signs of a first-rate urchin. Dessert proved to be just as strong as the savories. With an expressive blend of fresh pineapple and buttery cake, the dessert reminded me of Taiwanese Pineapple Cakes (fong li su) but writ large. 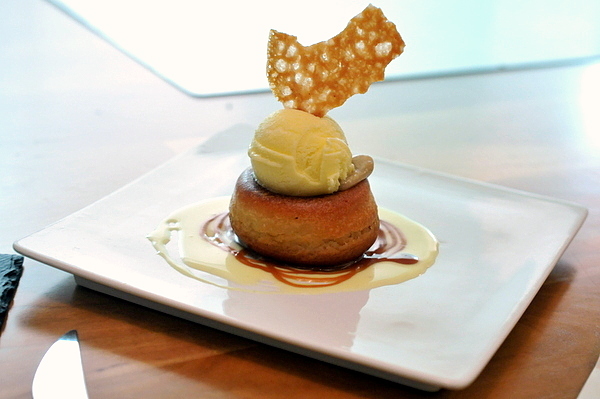 The caramel adds an endearing sugary sweetness while the lychee ice cream provides a nice chilling contrast to the warm cake. I'm pleased to see Sushi Den is still going strong. 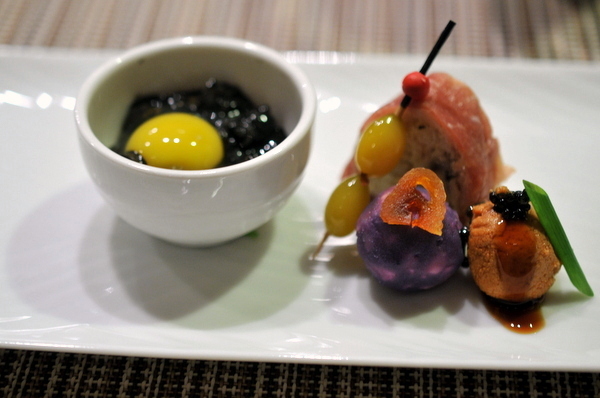 The fish quality and selection falls a bit short of the best places that I've been to and the menu caters to a more Westernized palate than mine, but the meal was still very enjoyable. 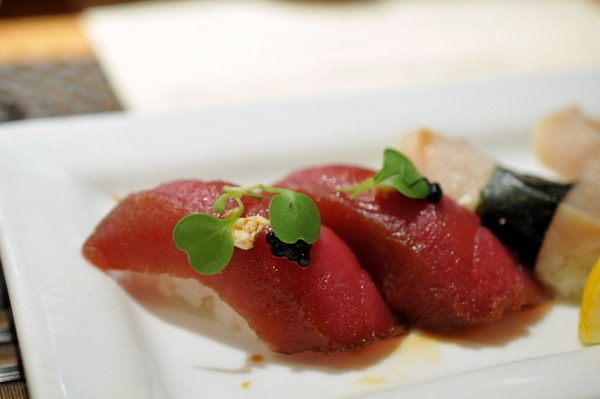 The food doesn't have the European flair that Sasa's does, but when it comes to sushi, Den is still the best bet in Denver. 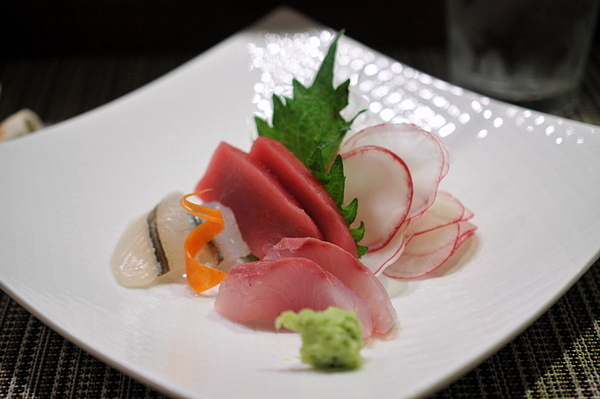 Opened by Chef Shunji Nakao of Asanebo fame, Shunji Japanese Cuisine offers a modern take on kaiseki that has made it the darling of the LA Sushi world. Housed in what was originally an outpost of the Chili Bowl. The restaurant is actually shaped like a chili bowl leaving just enough space for an 8-seat bar and a handful of tables. Chef Nakao cut his teeth at Matsuhisa back in 1989 where he was one of the three original chefs; along with his brother and Nobu himself. 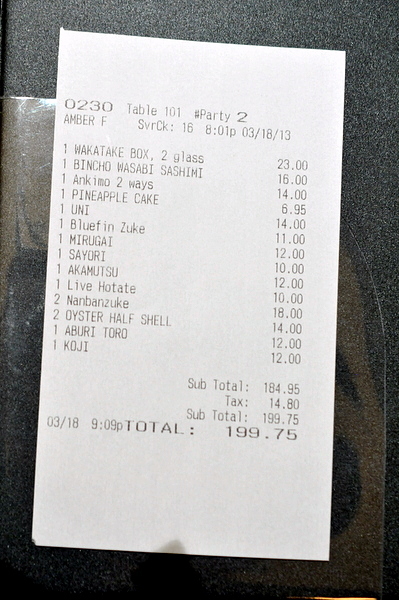 Nakao struck out on his own in 1991, opening Asanebo in Studio City which remains in business today and is considered one of the top spots on a street littered with sushi restaurants. Nakao's subsequent ventures haven't met with as much success, working at The Hump and Tengu both of which subsequently shuttered. Then in 2011 he opened the first incarnation of Shunji but left abruptly after falling out with partner Cecil Hsu. 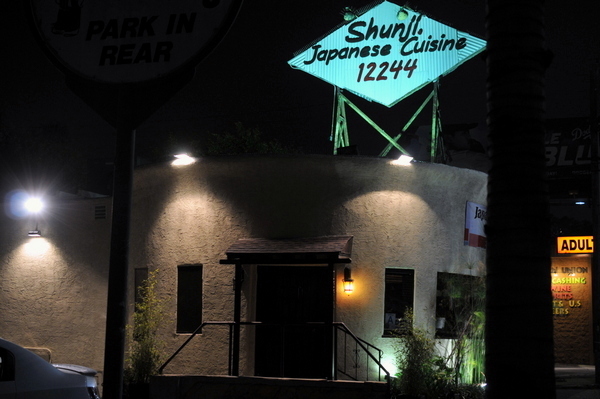 Following his departure, the restaurant was subsequently renamed 7015 Melrose Sushi & Sake and closed earlier this month. 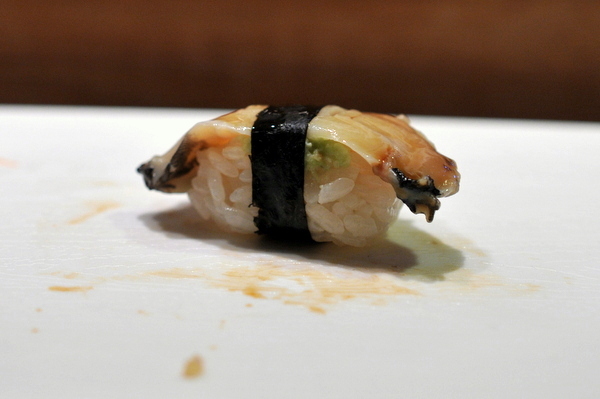 The meal got off to a fantastic start with a unique take on anago. The slivers of raw eel look similar to squid and have a similar texture but without the creamy finish which paired beautifully with the lightly astringent tang of the vinegar. 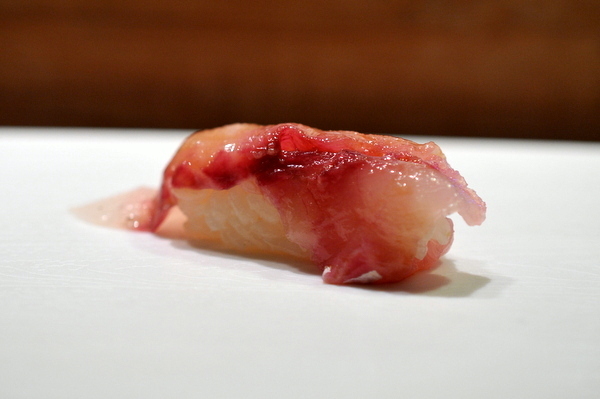 Unlike the more common squid used for nigiri, the Hotaru Ika packs a surprisingly complex flavor that combines delicate salinity with a nuanced earthy bitterness. 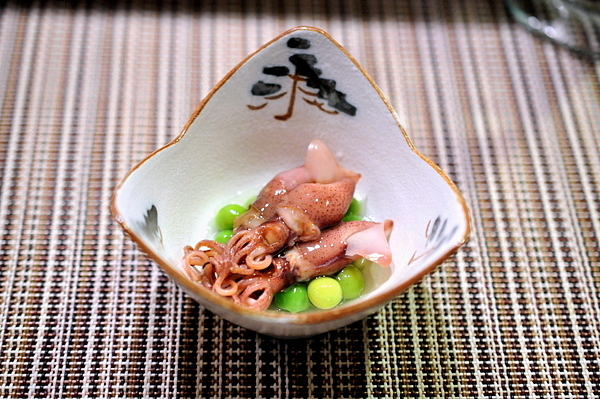 The bed of peas provides a slight nutty accent to the squid. 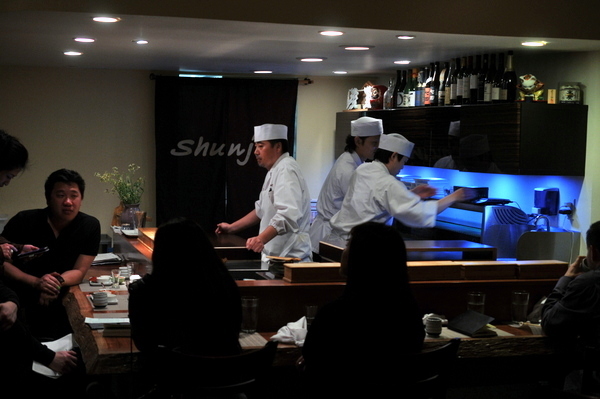 Part of Shunji's allure is its unconventional mixture of European techniques and flavors into the kaiseki framework. 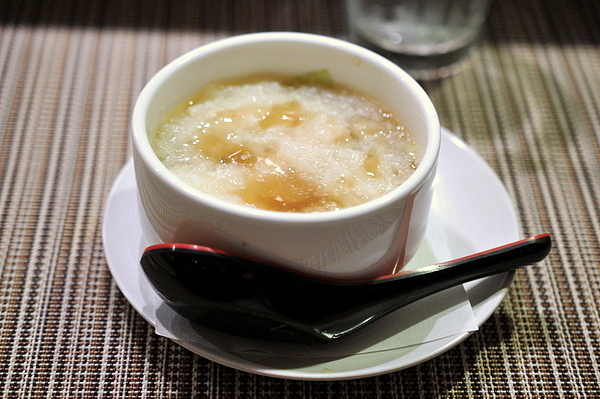 This soup deftly demonstrates Nakao's creativity, the cool creamy potato soup has a smoky chowder like essence. 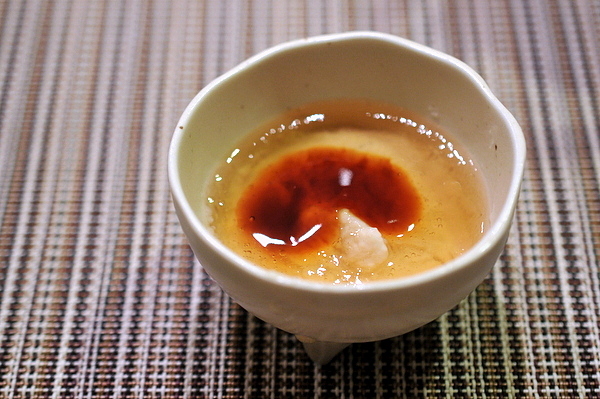 The handful of times I've had shirako it was always served pristine, but Nakao pureed the milt into a thick paste. The "tofu" has a texture that is creamy with the slightest hint of grit and an earthy salinity that would have been less disconcerting if it wasn't made from sperm. 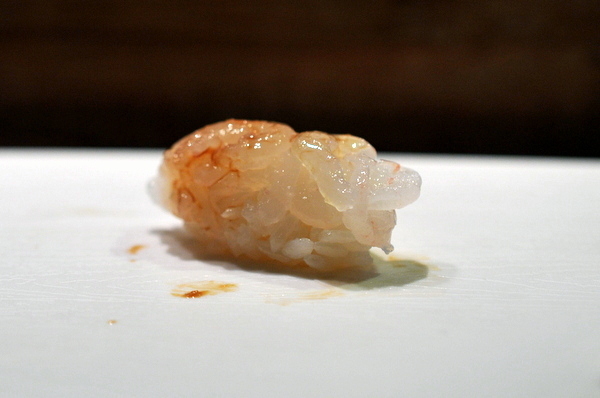 The sharp tang of the ponzu jelly gives the dish a sense of levity to counter the weighty feel of the shirako. 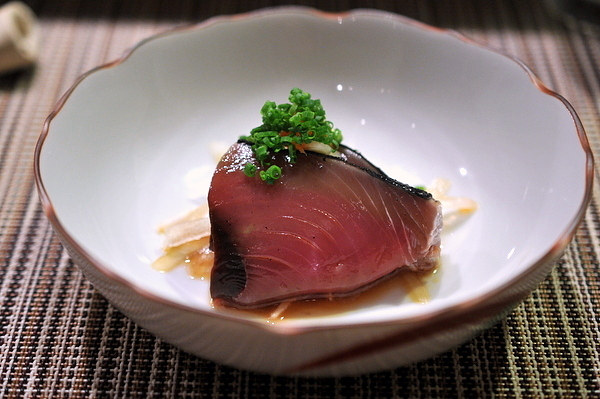 The bonito was on the leaner side and the raw preparation lacked the savory depth that I'm used to from seared bonito. 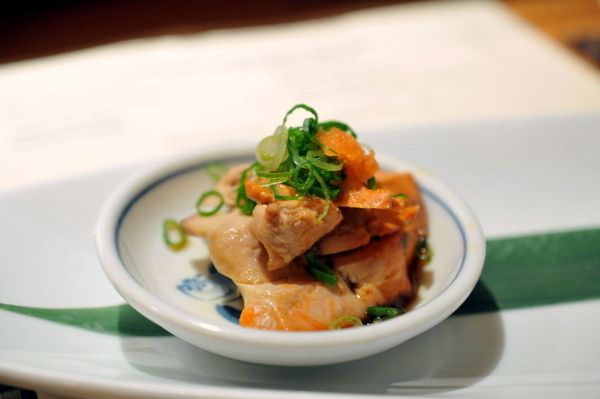 The mild flavor was further overwhelmed by the herbaceousness zest of the ginger and onions. This might be my first time having blue cheese at a Japanese restaurant. 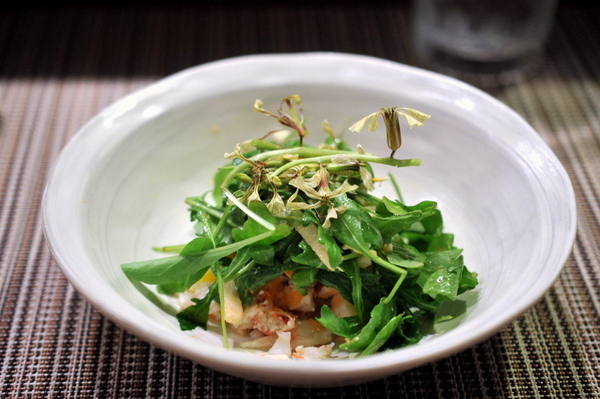 The arugula astringent nuttiness of the salad is tempered by a subtle funk from the cheese. The lobster, arguably the star of the dish, was a touch overcooked and bland for my tastes. I started off with the ankimo and caviar, the creamy liver melted in my mouth while the caviar provided the right touch of saltiness. The potato was surprisingly effective, pairing a ripe sweetness from the persimmon with the pungent heft of the blue cheese. The nuts were fairly simple, serving as a break between the more complex courses. The only miss of the plate was the Okara, the sweetness of blue crab takes on a fishy character when combined with the prosciutto. We were told to save the squid for the end and with good reason, the dish is one of Shunji's signatures and brimming with heady aromas of truffle and a silky expansive richness from the sauce of egg and uni. 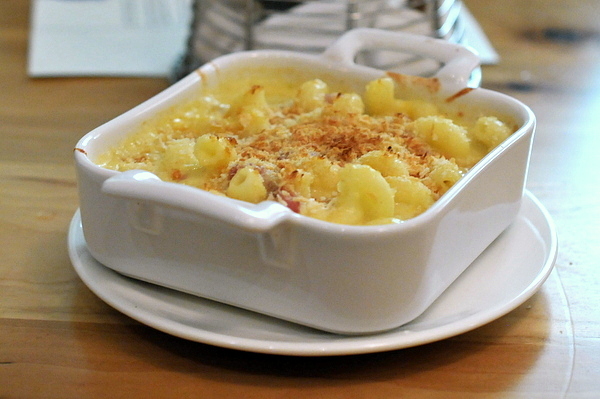 The bamboo shoot had a crisp texture similar to hearts of palm with a flavor reminiscent of corn. 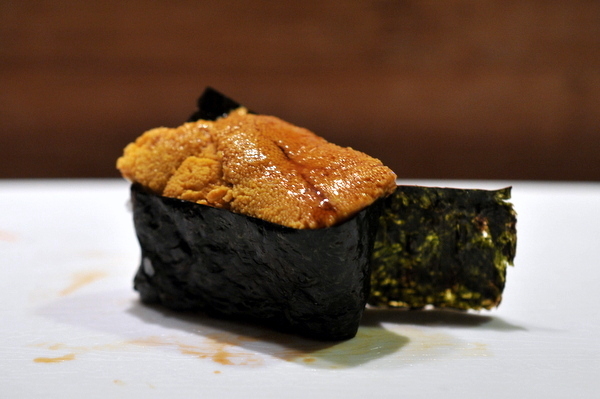 The urchin roe augmented the natural sweetness of the bamboo while the seaweed added a subtle umami contrast. This was probably one of my favorite courses of the night. In terms of flavor I find actual agedashi tofu tastes better but the creativity and technique made the tomato incredibly satisfying. The tomato has a saturated dense texture akin to dense tofu with a touch of glutinous rice-like starchiness. 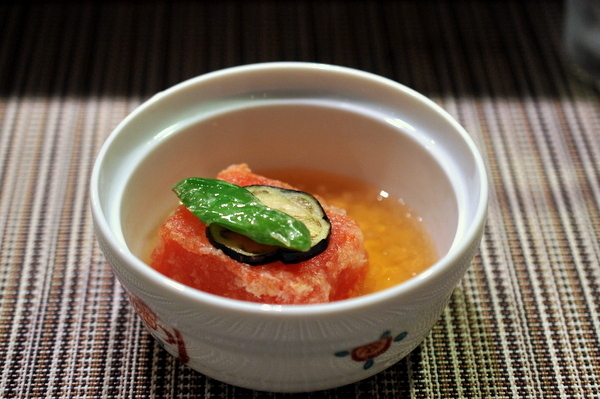 In terms of flavor, the dashi provides the lion's share with an acidic verve from the tomato. The grilled yellowtail felt a bit rudimentary for a meal of this caliber but to the kitchen's credit the fish was cooked perfectly. 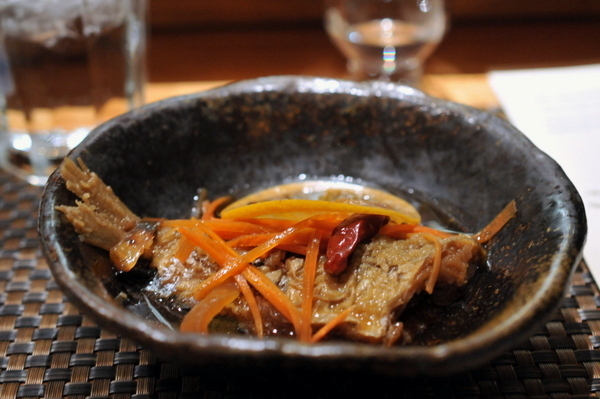 The yuzu helped temper the smoky heft and oiliness of the fish, though it could have been a bit more apparent. The yamamomo was a nice touch cleansing the palate with a ripe fruity sweetness. 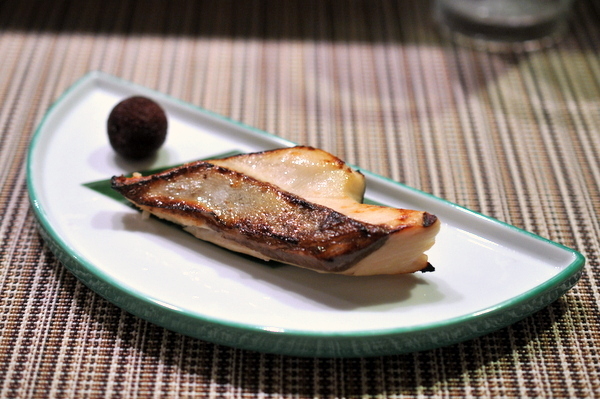 Our second cooked fish consisted of black cod in a dashi thickend with yama imo. The mucilaginous texture of the broth was a touch disconcerting as was the musty nose of the porcini, but the black cod itself was fatty, flaky, and quite delicious infused with the flavor of dashi. 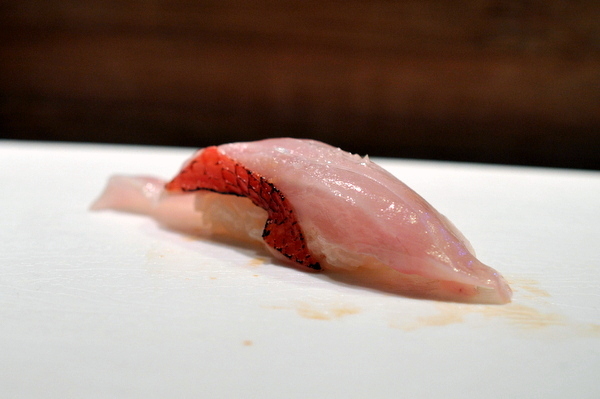 The regular grouper had a similarly dense texture though with a touch more moisture to it. Seasoned with a brush of soy the fish started out mild but finished with a potent pop of flavor. 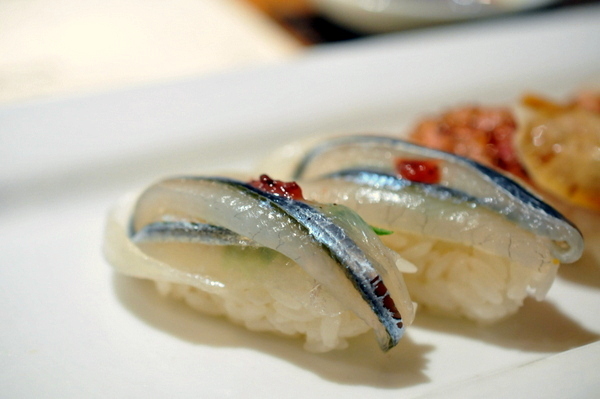 Yet another rare fish, the Jack Mackerel had a color more like Amberjack than Mackerel but with the unmistakable oily smack that only comes from the Aji family. 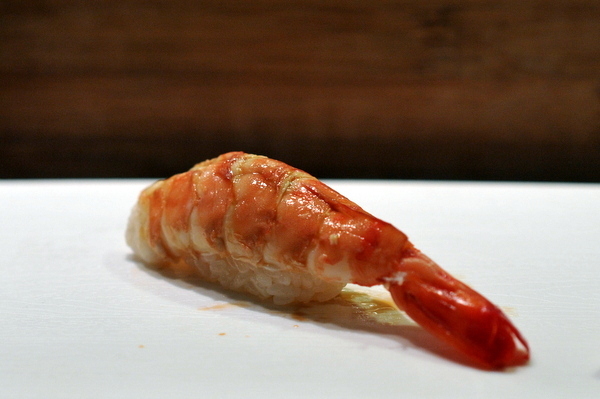 Despite its expense, I've always been fairly indifferent towards Shiro Ebi. 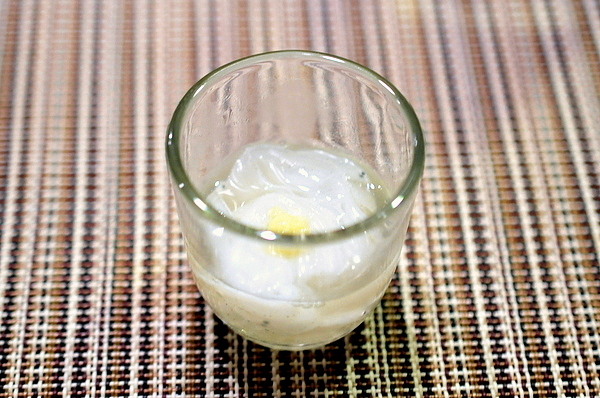 The tiny shrimp lack the firm crunch of raw amaebi in favor of a creamy texture reminiscent of raw squid after mastication. The one thing I always look for with ikura is pop, that moment when the egg bursts coating the tastebuds in sweet salty goodness. 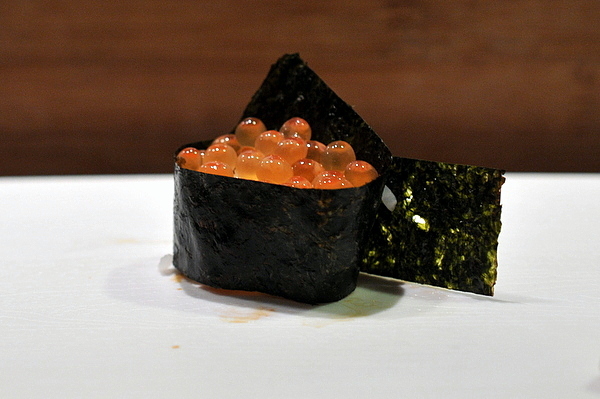 Nakao sets his ikura apart by soaking them in chilled dashi giving them a more nuanced flavor. 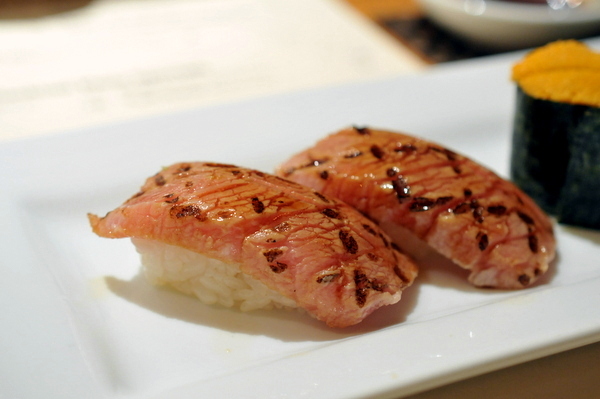 Flying fish is more commonly known for its eggs when it comes to sushi. Fairly lean with a nice gellied consistency this would have been satisfying but the grated ginger was far too intense for the mild flavor of the fish. 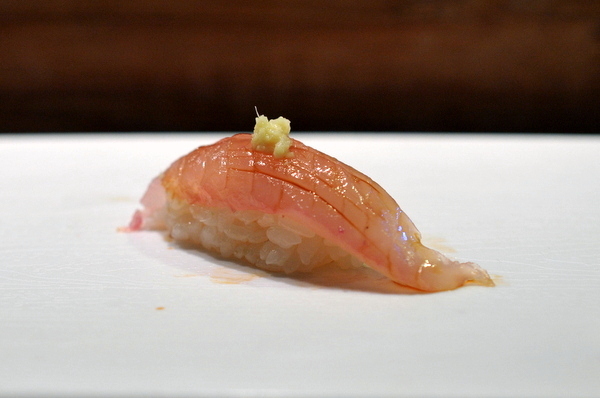 Classic Kanpachi, the fish is doused with a bit of citrus in addition to the soy giving it a light acidic counterweight. Kinmedai is always a treat a quick kiss from the blowtorch gives the fish a seductive aroma of char to compliment the salinty of the kelp curing. 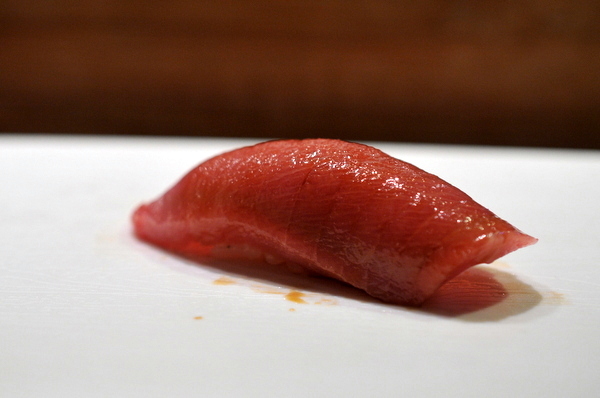 Like the maguro, the toro is perfectly uniform with an utterly soft tenderness and plenty of fatty goodness. I've also never been a fan of cooked shrimp but these prawns from Papua New Guinea had an intense sweetness to them as well as retaining a bit of crunch. Though most of the party was getting quite full by this point everybody answered yes when Shunji asked if we wanted uni. Creamy and sweet on the palate but with an unfortunate trace of bitterness on the finish. This was my first time having Kaiwari, the fish reminds me a of Shima Aji tender and jellied with a hint of oil to compliment the soy. 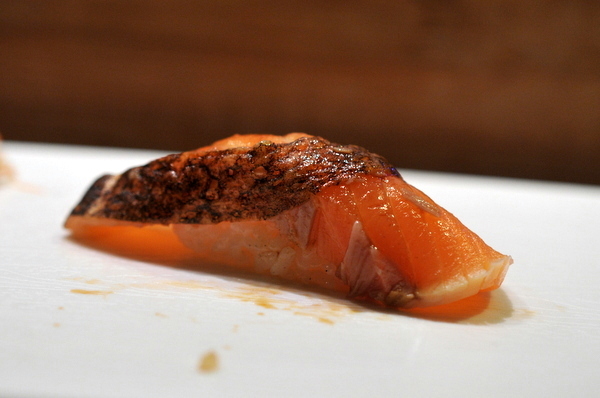 We tried the salmon on Nakao-san's recommendation. Very similar to smoked salmon in terms of texture and flavor, but a touch to much salt and smoke for my tastes. 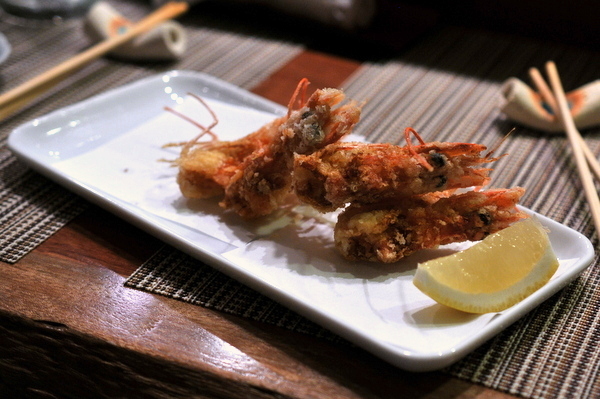 These were some of the best shrimp heads that I've had in a while. Fried just to the point of dissolving on the palate the savory batter is complimented by the offaly richness of the brains. 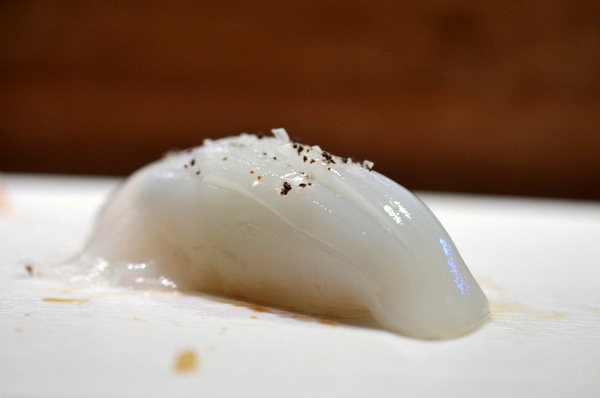 Nakao-san doesn't tenderize his abalone by making shallow cuts along the surface making it possible to appreciate the mollusk's dense muscularity in all its glory. 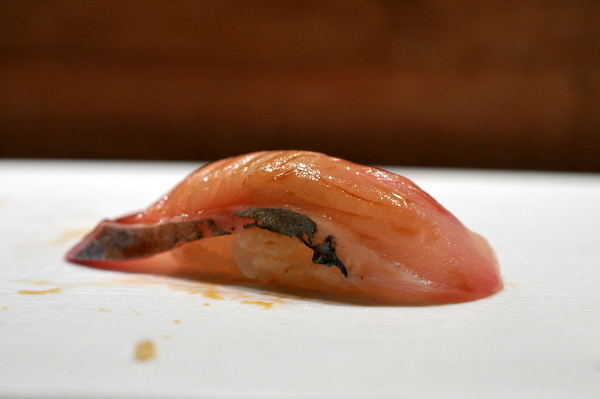 Our last nigiri was presented just like our first with a dusting of salt and pepper. 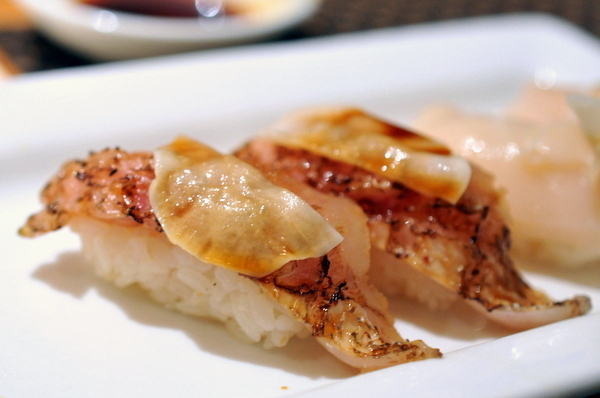 The squid takes on a creamy consistency as it warms up that fits nicely with the floral aroma of shiso. 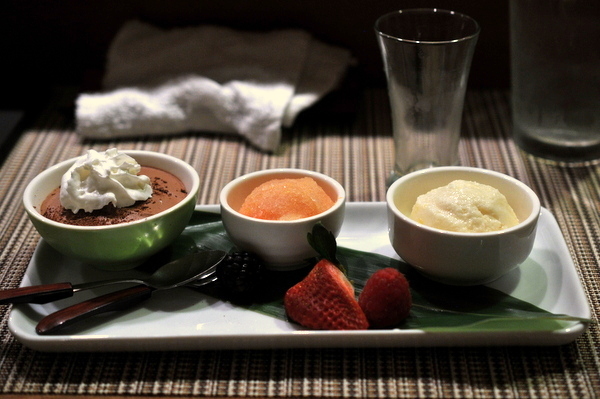 All three desserts were exceedingly well done and effective in their zen-like simplicity. The lemon ice cream is on the sweeter side but with the fragrance of the fruit thanks to a healthy dose of lemon zest mixed into the ice cream. The grapefruit sorbet was more intense with an almost bitter acidity, perfect after 28 courses of savory. The chocolate mousse was my favorite of the trio, rich and silky the chocolate dissolves leaving behind the essence of sweet cocoa. Shunji is everything a modern kaiseki restaurant should be, an intimate exchange between itamae and diner rooted tradition but not bound by it. 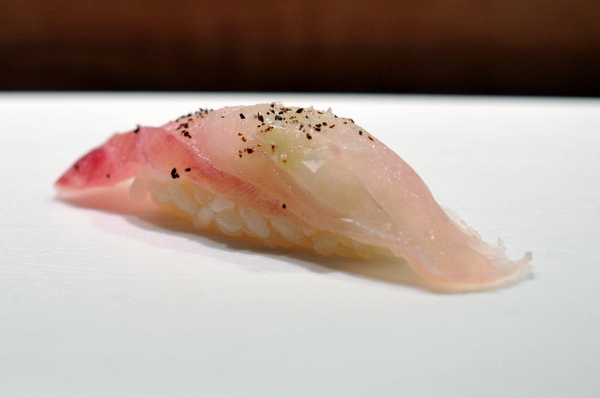 It goes without saying that the fish is impeccable, but the technique and creativity are really what make Shunji worth a visit.